Spain is surrounded by such eclectic culinary influences as France, Morocco, Africa, and the Mediterranean. Along the coast, regional specialties highlight fish and shellfish, while inland dishes focus more on creative, snack-like tapas dishes of meats, cheeses, and vegetables. Whatever your culinary appetite, it all goes down well with Spain’s famed fruit-filled wine, sangria. 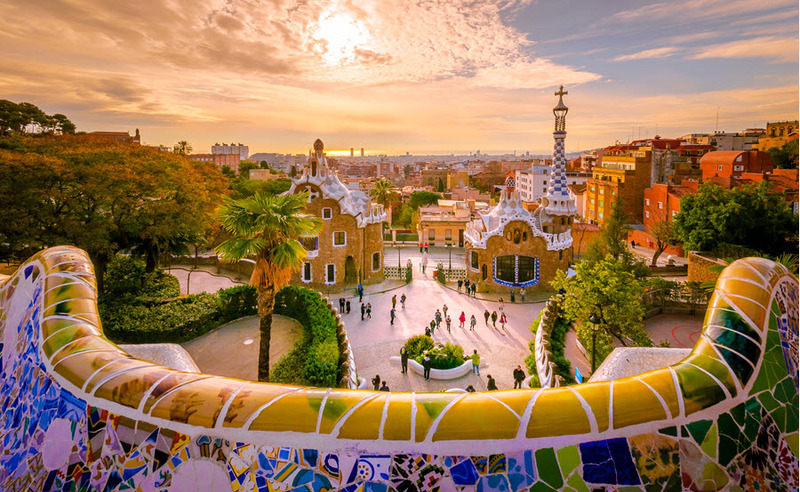 High tourist areas like Barcelona and Madrid have their fair share of restaurants and hotels serving delicious meals, but you’ll also find quaint towns and villages scattered throughout the country that have their own special ingredients, dishes, and culinary following. There are a handful of culinary schools in Spain offering different levels of education for those who dream of a career in the culinary world. In the larger schools, educational levels somewhat mirror schools in the U.S., offering technical and higher educational options. When it comes to how classes are structured, students in these classes (just like in American cooking classes) will learn kitchen procedures, cooking techniques, pastry, food preparation, food storage, and business practices in the hospitality industry. Escuela Universitaria de Hosteleria y Turismo (University of Hospitality and Tourism) in Sant Pol, Barcelona is in a small fishing village near Barcelona. This school’s educational levels are divided into Technical, University, Postgraduate and Specialization, and Professional Courses. Technical courses are three year programs that give an in-depth overview of both cooking and hospitality. The University program adds a fourth year to the Technical program, and qualified students to enter Postgraduate and Specialization programs. These are each one year programs that offer specialty courses in restaurant management, cooking, food and beverage and catering. Professional, continuing education courses offer courses in marketing for hospitality managers and owners. In some programs, students are required to take English and French language classes to enhance ability to work in the international culinary and hospitality scene. For a shorter, but equally educational program, Escuela Bell Art (Bell Art School) in Barcelona offers a Professional Chef program lasting 18 months. The program consists of two nine-month courses that cover culinary basics, creative cooking, Mediterranean cuisine, and desserts. After this initial program, students may continue on with nine-month intensive courses in pastries, hospitality, appetizers, and desserts. Bell Art also offers two-week continuing education or personal interest courses that are not part of any degree program. Coquus Cooking School is an example of a smaller cooking school in Spain. Instead of degrees and graduate programs, it offers single classes for professional or hobbyist chefs. This option requires a much lower level of commitment of time and resources, which may suit some culinary types better than the long-term educational path. Coquus offers one-day classes in a variety of styles of cooking, from Japanese to traditional Spanish meals like Paella, Chinese and Mediterranean. Classes are offered in Spanish only. Class fees are generally around €65 per person. Once you have graduated from a culinary or hospitality program in Spain, you will be qualified to work in restaurants, hotels, or pensions throughout the country and even the world. Are these schools able to provide housing…or at least information about renting an apartment? I m Leticia Soler and I am teaching japanese and thai food ,since I came back from Japan,where I lived during 7 years until 2008, when we move back to Barcelona. I dont have my own school but I work in several places in town offering a Unique experience in my lessons. Not only you will learn how to cook with me, practicing with me all the techniques and tips for a great learning experience and fun as well.It is ideal to join the class with some friends and meet new people as well. It is a great opportunity to learn some new cooking tips, new textures, flavors and combine them with Mediterranean taste and ingredients.You can take all this new concept home ! Lessona are in Sarris /sant Gervasi area and Pedralbes area and Borne. Hello, i was wondering if it would be possible to send me more information about the medium-lenght courses at the Escuela Bella Art. If it better to contact me through telephone my number is: 622 69 35 47. (spanish mobile). I interested to Study on “Cooking and food production” on your organization.